If you’re going to ride the Philadelphia SEPTA commuter rail this week don’t be surprised if all of a sudden you feel like you’re on an acid trip on your way to work. 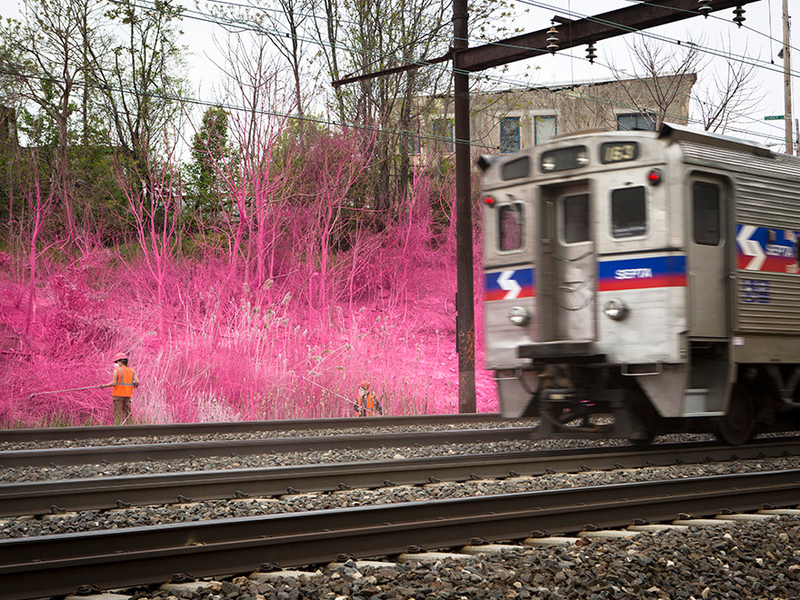 Commissioned by the City of Philadelphia’s Mural Arts Program, German artist Katharina Grosse has created seven eccentric murals along the tracks of the city’s commuter train. Psychylustro, the title chosen by Grosse to describe these series of murals, is intended to make the audience feel as though they are living in a cartoon world mirrored by their everyday experiences. The murals are a series of abstract paintings that often incorporate one stand alone color and are created by Grosse and her 8 assistants through the use of high intensity acrylic paint on spaces that are either rundown or haven’t been left desolate. Making the scene look as if it has been mutated by toxic waste. If you are interested in taking a look at all the seven pieces you will be able to find them following the path between 30th Street Station in Philadelphia and Atlantic City in New Jersey.